Our research aims to understand the genomic and epigenomic mechanisms underlying the neurodevelopmental disorders through the employment of cell reprogramming in order to develop physiopathologically meaningful models. In our ongoing project we are studying the pleiotropic role of ADNP, the most frequently mutated gene involved in de novo syndromic autism, using iPSCs and iPSC-derived neural crest stem cells and cortical neurons as cellular models. In collaboration with other international research centers, we are trying to address the multiple function of ADNP in epigenetic and transcriptional regulation, and propose now to further investigate the involvement of this factor in the onset of syndromic autism and intellectual disability. Current hypothesis is that mutations in ADNP compromise its interaction with SWI/SNF complex (human BAF) leading to the so called Helsmoortel-Van der Aa syndrome. 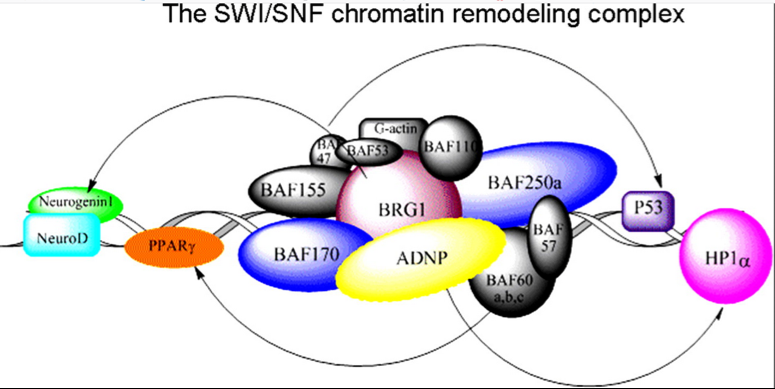 Proper functioning of the BAF complexes plays critical roles in neural development, including the establishment and maintenance of neural fates and functionality, as demonstrated by recent human exome sequencing and genome-wide association studies. Moreover, transcriptomic evidence in iPSC models suggested an imbalance between SWI/SNF and the Polycomb axis of regulation as a result of ADNP mutations.